Home > News > Hear From Business Schools > What Is The Future For The Two-Year MBA? What Is The Future For The Two-Year MBA? In May, the University of Iowa’s Tippie College of Business will graduate its final MBA cohort. After 57 years, the school’s flagship business master’s program, which was hemorrhaging cash as student numbers dwindled, is shutting down. Tippie made its shock announcement in 2017. It caused uproar among students, staff, and alumni, who reckoned their expensive degrees were being devalued. But Tippie is not alone in ending its MBA. Wake Forest University announced in 2014 that it would drop its full-time MBA program after several years of flagging application numbers. Some new business schools are being established without MBAs, such as King’s Business School in London. Does Tippie’s move to close a seemingly revered course mark a tipping point for the full-time, two-year MBA? Are two-year MBAs on their way out? The prize degree of US business schools has been around for more than a century. But there are signs that its relevance is waning. Applications to US full-time MBAs have sunk for the past four years on the bounce, says the Graduate Management Admission Council (GMAC). Some high-fliers are turned off by the opportunity cost—tuition fees are in the six figures at top schools and, with 24 months out of work, the lost earnings can be just as big as the bill. Many prospective students are turning to shorter and cheaper courses, such online degrees, instead. Nick Barniville, associate dean for degree programs at ESMT Berlin, believes that MBA demand may have “peaked”. His claim is backed up by news that applications fell globally in 2018 for the first time, if only slightly. The slide was worst in the US, the ancestral home of the MBA. “The US MBA market is in bad shape, both from the domestic perspective, where some potential applicants are taking shorter courses or moving online, and from international applicants, who are completely turned off by [US president Donald] Trump, his behavior, and his immigration policies,” says Nick. In 2018, 70% of US schools that have full-time MBAs saw sinking application volumes for their two-year courses, according to GMAC. But the business education market is booming elsewhere: applications to schools grew by 8.9% in Asia Pacific and 7.7% in Canada last year, for instance. That is a stark contrast to the US, where visa uncertainty is a main factor behind the waning demand for MBA degrees. The application plunge has been steepest among the international students whom US schools rely upon to enrich their classrooms. Previously, the declines had not affected the most elite institutions, which could rely on their brand to draw in candidates to their pricey programs from around the world. But in 2018 the top schools have felt the pain too. Applications to Harvard’s MBA fell by 4.5%, while Stanford’s were down 4.6%, for example. Bill Boulding, dean of Duke University’s Fuqua School of Business, which posted a 6.2% application tumble, says this is not a one-off, but he does not reckon it’s the start of a longer-term trend, either. “There’s no doubt in my mind that the two-year MBA within the US will remain viable for years to come,” he says. US schools lay much of the blame at Trump’s door, claiming that his administration’s more stringent visa checks have dampened demand from international students who have for decades come to the US with the expectation of securing a well-paid job at a well-known company: the American dream. Bill points out that the US visa problems pre-date Trump’s administration however, saying that securing a H-1B work visa is akin to “winning the lottery”. Alex Min, CEO of The MBA Exchange admissions consultancy (pictured above), is optimistic on the future of the degrees. He points out that many top US schools maintain lofty positions in MBA rankings, such as those produced by the Financial Times. “Even hinting about [closing an MBA] could immediately alienate applicants, offend alumni, discourage corporate recruiters, and become a self-fulfilling prophecy,” says Alex. 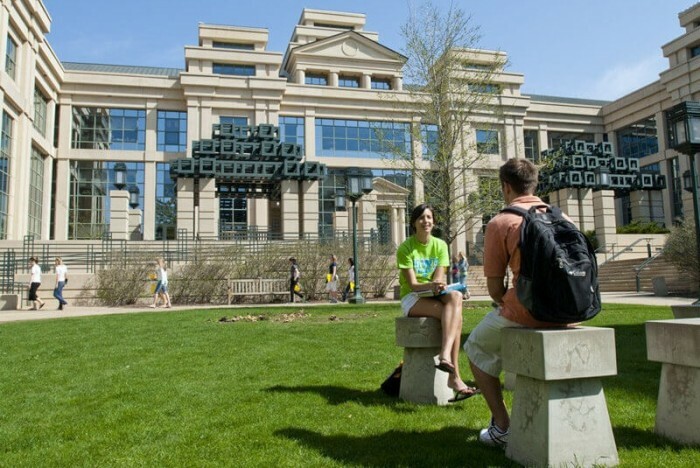 The Wisconsin School of Business, for instance, saw a backlash after announcing in 2017 that it was considering closing its MBA, only to backtrack. Programs run in remote pockets of the US may be more at risk. According to Alex, students at mid-tier schools in small towns face logistical challenges to secure work. And many internationals find the cosmopolitan culture of large cities more appealing. But he says less prestigious schools with falling application figures could be tempted to differentiate themselves by offering less costly one-year MBAs, and more specialized degrees. When King’s College London opened a business school in 2017, for example, it did not offer an MBA. Instead, the first crop of 1,233 students studied specialist master’s degrees, in areas like entrepreneurship or finance. The school’s dean, Stephen Bach, says employers are largely program-agnostic. But he acknowledges that the demands placed on full-time MBA students can be intense. “Two years out of a regular salary forces all kinds of compromises and will often involve moving or leaving behind a young family,” says Stephen. It is harder for US schools to tempt prospective students out of the workforce because of the strength of the American economy; they may miss out on higher wages or promotion. Schools say it’s possible that US applications could rebound when the global economy next takes a downturn. And under a more liberal administration, international applicants may view US schools more favorably. But MBA application swings tend to move at a glacial space, says Alex. So, any significant increase in international applications may be some way off. In the meantime, two-year MBAs could remain a tougher sell.